So this week I’ll be doing a quick review of the Scroll 4 calligraphy nib by the Manuscript Pen Company. The scroll nib concept is simple enough: it splits a regular italic nib with a second slit and a notch out of the middle, thus creating two lines when applied to the paper. The Manuscript scroll 4 has this simple design, with “No.4 Scroll England” stamped into it as well. 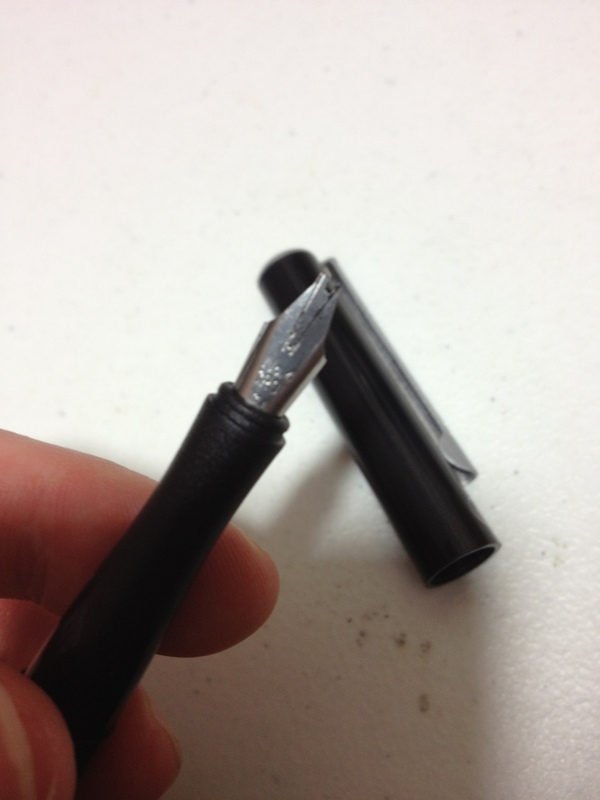 Writing is much easier than with a standard calligraphy fountain pen nib. The feed seems designed to keep up very well with all kinds of calligraphy nibs. Very little pressure is required to write and may even hinder performance at times. Each line is about a millimeter wide with one being slightly smaller than the other. To write with this nib, one must adjust their calligraphy a little bit but not very much, it is a very easy nib to use, though even with gentle use the small tines get misaligned every now and then, causing them to pop and either momentarily spit a small glob of ink or skip. Overall this is a fairly nice nib that is well suited to its purpose of calligraphy, and while it doesn’t have many other (if any other) uses, it is still quite fun to play around with sometime, and this particular one doesn’t cost much.